Migration and asylum have become central topics of controversial discussion in the European Union and its member states. ACT Alliance EU follows changes in these policy areas and argues for human rights sensitive and sustainable EU migration and refugee policy. Special attention is paid to the external dimension of EU policies and third country relations, and their effect on asylum seekers, persons in need of international protection and migrants. This follows the work stream of our members, as the response to forced displacement is generally considered to be humanitarian aid, while the long-term solutions to address drivers of migration are development aid programmes. 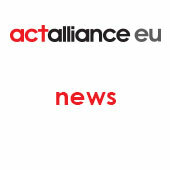 The advocacy work of ACT Alliance EU is in harmony with ACT Alliance’s Migration and Displacement Programme, completing it with work on the European level. Building on existing international and EU law and policies on asylum and migration, using the evidence of ACT Alliance EU member organisations’ respective programs, the evidence- and rights-based advocacy work of ACT Alliance EU aims at bringing policy makers closer to experiences and difficulties from the ground while keeping the legal framework intact and developing towards more protection centred, rights-based directions. Exploring the migration-development nexus and difficult questions of development financing used for so called migration management are key issues of ACT Alliance EU’s advocacy work. EU finances and programming, migration-centred cooperation with third countries like Turkey or Libya are other cornerstones of advocacy work to ensure partnerships that stand up to scrutiny and respect EU law.